William Cecil was his own architect. 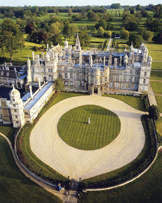 During the 1540’s, when William Cecil was establishing himself both politically and economically, there was a change in architectural fashion in England. The Italian influence was superseded by the classical style of buildings that were popular in France and Flanders. During the 1560’s, designs from the Low Countries, particularly those of Hans Vredeman de Vries, were influential in England as were those of the Italian architect Sebastiano Serlio and the Frenchman, Philibert de l’Orme. The construction of Somerset House by the extremely powerful Duke of Somerset, for whom Cecil worked, was hugely influential both to Cecil and to other builders of great houses. In the late 17th century, the 5th Earl inserted arched windows on the south front to enclose a gallery and possibly to repair damage caused during the Civil War, when Cromwell’s forces subjected the house to a brief bombardment. When Brownlow, the 9th Earl, inherited in 1754, he promptly employed Lancelot ‘Capability’ Brown to mastermind the modernisation of the Garden, the surrounding parkland and aspects of the House itself. Brown levelled the roofline elevation of the south front, constructed extensive stables, a fashionable Orangery and a Gothic garden Summerhouse. He also demolished the single storey north-west wing to open up the north courtyard and to give views of the newly planted parkland. After Queen Elizabeth’s coronation in 1558 there was a feeling of optimism for a period of peace and stability in England. Many of the great men of the day began the construction of substantial houses: Cecil amongst them. 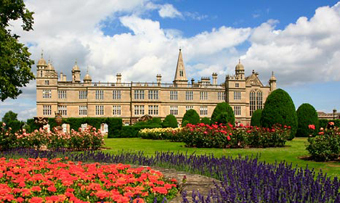 Initial works at Burghley coincided with that of other ‘prodigy’ houses such as Sir Thomas Tresham’s Lyveden, Longleat, initially built by Sir John Thynne and Kirby Hall, optimistically constructed by Sir Christopher Hatton, one of Queen Elizabeth’s ‘comely young men’ and later her Lord Chancellor, who hoped in vain to receive the Queen at his new home. 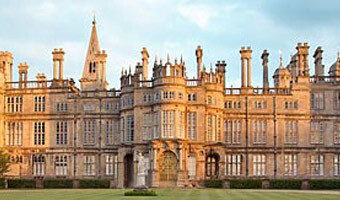 It is thought that William Cecil’s father’s House occupied the north range. William Cecil’s initial design favoured the west range as a principal entrance but by 1587, when this range was completed, it seems that this side of the house was a more practical entrance. Before the demolition of the north-west wing in 1765, this must have been a damp and shadowed courtyard, north facing and cold. With the admission of sunlight, the marble statue of the young Bacchus was brought out from an interior hall by the 9th Earl, to oversee the newly visible parkland with its young avenues of lime trees. 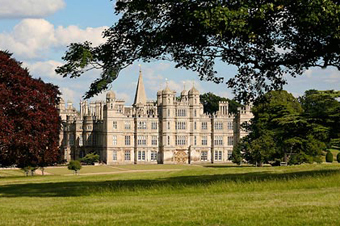 The south face of Burghley originally had an open gallery at ground level. Whilst an attractive feature, it must have been difficult to use in the winter months. In the late 17th century, the gallery was enclosed by the insertion of 14 arched windows and a central doorway. The view of the house obtained from the south makes apparent the addition of the Great Hall and most of the east range at a later stage of the original building programme. The obelisk that crowns the clock tower of the Inner Court may seem strangely placed but is central to the view from the west, which it was designed to complement. Most of what seem to be second-storey windows are in fact blank frames as the internal height of the first floor staterooms, more than 18 feet, occupies the fullextent of the structure. The central gatehouse is strongly reminiscent of the façade of Somerset House in London. The third floor of the gate-house forms the Prospect room, extensively glazed and offering wonderful views, both of the park and of the Inner Court and the intricate roofscape. We now think that William Cecil’s original west range was completely demolished and rebuilt by him during the later part of the 16th century. As ground level, the gilded wrought iron gates are the most marvellous centrepiece. They were made for the 5th Earl by Jean Tijou, one of the greatest Huguenot ironworkers. In the early evening, as the dying sun causes the windows on this side of the house to glow as if alight, the sparkling gates, which carry the Earl’s crest, are a fitting reminder of his huge influence on the decoration and content of this great House. The East side of the house was designed to house the domestic apartments. It was substantially altered during the later stages of the original building period as the usage of the rooms within developed. Looking at the elevation of the Great Hall from the Orangery Court, it is apparent that many of the original windows have been blocked. The mason’s work to achieve this is recorded in the late 18th century. It is assumed that the huge weight of the oak roof, covered with Collyweston slate- a locally produced slate first used by the Romans – was causing structural problems and that a radical reduction in the glazing was needed.